As a child from approximately 4 years of age, whenever my mother, Ela Beder Cope, received a letter and began sobbing I knew it was from my bobba, Dvora Brayne Valdman Beder. She died in 1940, before the German invasion of Lithuania. My mother kept in touch by letter with her sister, Chaya Rochel Beder Segal, until mid-1941, when Lithuania was invaded by the German army. Later somehow, word was received in South Africa, that the Jewish population of Rokiskis was annihilated. In the early 1950's, when I was still at high school, a letter arrived from Lithuania from my cousin Simcha Segal (son of Chaya Rochel Beder and Berel Segal). It transpired that he, at the age of 19 years was conscripted into the Russian army which occupied Lithuania after September 1939 following the secret pact between Stalin and Hitler. Simcha left Lithuania with the retreating Russian army and returned in mid-1944 with the victorious Red Army, having been decorated for bravery on four occasions. Simcha was also wounded on four occasions. He married a Russian Catholic nurse who nursed him when he was wounded. Letter from Simcha Segal in Lithuania to Ela Beder Cope in South Africa, 1958 Click on the letter to see larger version as well as translation. My mother kept in touch with him by letter. This was sporadic because his mail was censored by the Russians. He asked us in one of his letters to send him Streptomycin, which we did. There then followed a period of about a year before we heard from him again. We were not allowed to send new clothes; they had to be second hand. The parcels we sent him could not come from South Africa (This I think had something to do with Apartheid in South Africa and Lithuania was "communist"). The parcels were sent via London. The Russians then would not allow finished clothing to be sent, so my eldest brother would send him cloth from London. Simcha's wife passed away in 1965 and he died from Hodgkin's Disease in 1975. They were survived by two daughters and a son. We lost touch. 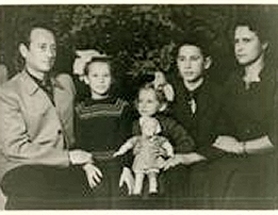 Simcha and his family in Lithuania in the 1950's. My mother wrote letters that were unanswered. She died in 1992. By then the internet became popular and the wall came down in Berlin. I sent e-mails to various places including the Lubavitcher rabbi in Vilna. Simcha's children tried to contact my brother Sydney. They apparently had an address for him and they sent a letter, but he had relocated and never received the letter. I was always interested in what my parents called "der heim." My eldest brother Sydney was born Rokiskis in 1922. He and I and our respective spouses decided to go in July 2006. We booked a trip to Vilna. We hired Danny, a Jewish interpreter/guide. 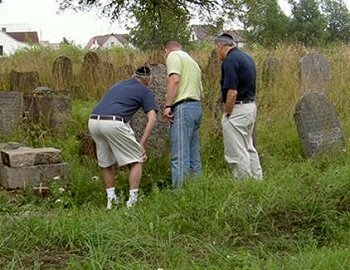 About two weeks before we left I found on the internet that there was a museum in Rokiskis which I contacted in connection with Simcha's children. Several days later, there was a reply that the girls were living in Rokiskis. The son had died. I was given a phone number, which I phoned. Raja, Simcha's eldest daughter answered. We couldn't understand each other because there was no common language through which we could communicate but tears flowed at both ends of the phone line. Several days later we arrived in Rokiskis. We met in what was the old town square. I recognized my cousins because Raja was the split image of my mother and Bella looked like my sister. It was an emotional meeting. We were well received. They took us to Raja's daughter's apartment, where we were offered food and drinks. Raja said that the meat was "not chazar." We then walked through the town. My brother wanted to find the house that he and my parents lived in. The house, he remembered, was behind the Church. He and Simcha used to come back from cheder (religious school) in the late afternoon, and in winter they carried lanterns and would cross a bridge over a river. When we found the bridge and the river, my brother said the bridge and river had diminished in size!!! He was 8 years old, when he left. He returned after 77 years. We continued our search and found the house. The house had been added to. My brother was on a high that day. My cousin took us to the Bajorai killing site about 4 kilometers outside Rokiskis, where about 2000 Jews were rounded up and executed. They were made to dig four mass graves and were executed by Litvaks. My aunt and uncle, Berel and Chaya Rochel Segal, and their four children (Nussan, born 1924; Abraham Isaac, born 1926; Chana Leah, born 1928; and Meyer, born 1933) were executed as was my eldest cousin and her husband (Faige and Ruvin Berzon) and their two little girls (Rosa, born 1936; Sosa, born 1937). This happened on August the 14th 1941, about eight weeks after the Nazis declared war on Russia. My cousin Simcha aged 19 years escaped with the retreating Soviet troops. We also went to Simcha's grave. He was buried in the Catholic cemetery. We went on to the Jewish cemetery. I had a weird feeling. I had shivers running down my back. Here I was at the cemetery where my paternal and maternal grandparents, great grandparents and great-great grandparents were buried. The cemetery was not totally destroyed but most of the stones were turned over. A good proportion of the inscriptions on the tomb stones were readable. We tried to find the tomb stones of our predecessors, but unfortunately were unsuccessful. It would be something if the cemetery could be restored. There is still anti-Semitism in Rokiskis. Raja told me that there are "some people here who are not friendly towards you." This is why we did not request entering the house. I went to see a statue of J.Smuskevicius in the town square. I was at school with a Hymie Smuskowitz during the war and I remembered he had told me about his uncle being a Marshall in the Russian Air Force. It is ironic that a town that slaughtered its Jewish population should honour a Jew as a hero!! !